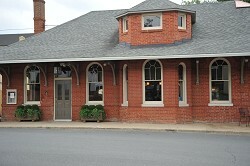 Claire's at the Depot, Warrenton, VA - The extensive renovations of the restaurant dining areas and bar revived some of the historic character of the former Warrenton Train Depot. The use of period appropriate materials, architectural elements and restoration of existing materials help create the new tavern atmosphere and provide an elegant dining experience. 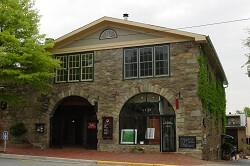 Middleburg, VA - Constructed in the mid-1930's, this one-story stone building was originally the site of a blacksmith shop. The renovations, which included uncovering the original stonework, were completed in 2002. The building now serves as a professional office. 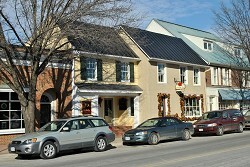 Middleburg, VA - E. Washington Street - A former hardware store was renovated into 3 retail spaces adding to the charm of the historic town's streetscape. Middleburg, VA - W. Washington Street - Outdated renovations were removed and a new exterior facelift and entry were given to this old car showroom now used as a small commerical plaza. 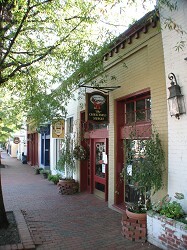 Middleburg, VA - W. Washington Street - The dark, outdated façade was renovated to give this building a fresh look. New colonial style trimwork and shutters help to discern between the two different retail spaces. Lighter colors and new window treatment brighten the streetscape as well. 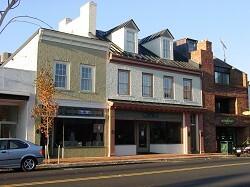 Warrenton, VA - Main Street - Extensive renovations to adjacent buildings in Old Town removed an eyesore from the streetscape. Old photos were used to help restore its original character. The structure is currently used for a restaurant and offices. 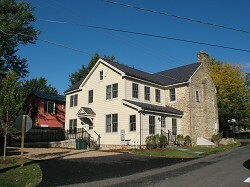 Middleburg, VA - E. Washington Street - A former residence was transformed into professional offices with an addition and extensive renovations. Middleburg, VA - This 2-story Federal style log house is one of the oldest documented residences in Middleburg. For the past quarter of a century this structure has been operating as a restaurant. This latest expansion included a new entrance lobby, kitchen and additional seating. 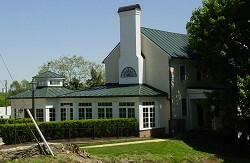 Levis Hill House, Middleburg, VA - This latest venture with the Windy Hill Foundation was for a 27,000 square foot apartment building designed for low income elderly residents. The 3 story brick and stucco building uses the slope of the site to reduce the scale and mass of the building from the street front. The design incorporates accessibility, energy efficiency as well as providing a comfortable living environment for its residents. Warrenton, VA - This 15,000 square foot office building was constructed for medical office support for the Fauquier Hospital. 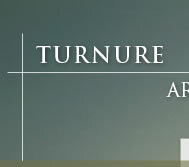 Warrenton, VA - This athletic club provides state-of-the-art facilities for an in-town location.